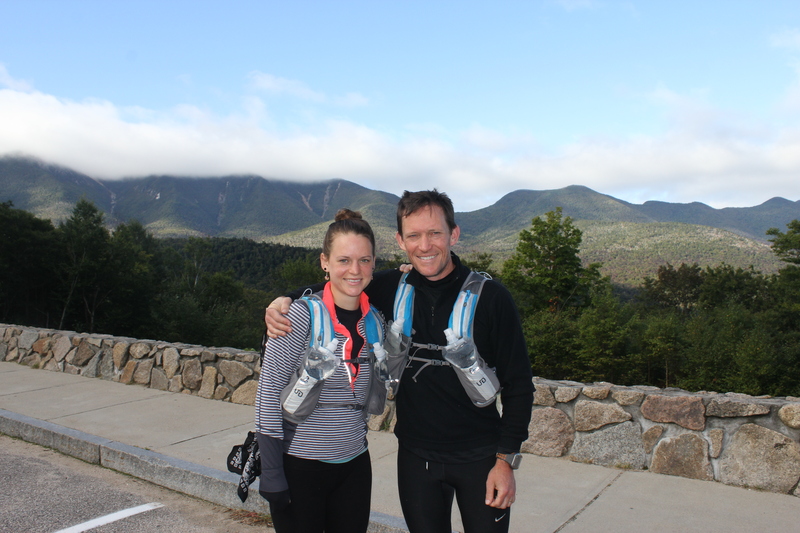 On Monday, September 8th, 2014, at 11:35 a.m., my daughter Brianna and I began an attempt to improve on the Fastest Known Times (FKTs) for hiking the Four-Thousand Footers, a group of forty-eight mountains in New Hampshire that are at least 4,000 feet above sea level. The rules for the Four-Thousand Footers FKT were established by “Cave Dog” Ted Keizer in 2002. Information about the FKT and its history is available here. The men’s FKT was set in July of this year by Andrew Thompson. His time was 3 days, 14 hours, 59 minutes. Prior to Andrew Thompson, the men’s record was held by Tim Seaver for over ten years. The women’s FKT was set in 2010 by Cath Goodwin. Her time was 4 days, 19 hours, 56 minutes. Brianna and I began our challenge at the Unknown Pond Trail to Mt. Cabot. We completed the challenge together on Saturday, September 13th, at 7:15 a.m., at the Lincoln Woods Visitors Center, after summiting Owl’s Head. Our course was 199 miles long and had 60,000 feet of positive elevation gain. Our time, trailhead to trailhead, was 4 days, 19 hours and 40 minutes. We fell far short of the men’s FKT, but unless some issue is found, Brianna has set a new FKT for a woman hiking the Four-Thousand Footers. Brianna’s account of the hike is available here. Dwight Eisenhower famously said that “plans are useless, but planning is indispensable.” This seemed to be the case for our hike, as we made significant changes to our plan as we went. The first change was the alternate route described on my previous post. Here we hiked the Pemigewasset Wilderness earlier in order to avoid hiking the exposed sections of the Bonds and the Franconia Ridge during bad weather, which was forecast for Thursday. This proved to be a good decision. Thursday brought rain and gale force winds on the summits. We had to battle these winds on Moosilauke, Cannon and North and South Kinsman, but these summits are not as exposed as those in the Pemigewasset Wilderness. The second change was a modification to the alternate route. The alternate route included summiting Owl’s Head between Galehead and Garfield. As we began this section, however, we decided that Owl’s Head made this section too long and difficult. With a quick analysis, we determined it would actually be quicker to hike Owl’s Head last (hiking in from Lincoln Woods) because, under the men’s rules, the clock stops when you reach the last peak. Under the women’s rules, the clock stops when you reach the trailhead after the last peak, but we expected that we would have plenty of time to complete the 9.1 miles from the summit of Owl’s Head back to the Lincoln Woods Trailhead within the time required to improve on the women’s FKT. This turned out not to be the case. The end of the hike was a mad dash from the base of Owl’s Head to the Lincoln Woods Trailhead. There were other smaller changes. We hiked Moosilauke before hiking the more difficult Cannon/Kinsmans leg because we needed time to recover after the long Pemigewasset leg. Also, late in the hike, sore joints made the descents more difficult than the ascents, so we hiked the Passaconaway/Whiteface/Tripyramids leg from east to west because there was less downhill running in this direction. We found that our plans did not adequately account for the degradation in speed that results from things such as darkness, the technical difficulty of trails, sleep deprivation, general fatigue, and joint pain. These and other factors (e.g., slow transition times) put the men’s record out of reach for me. I was very happy, however, to be a pacer for Brianna, and I continued with her until she completed the challenge. Under the rules of the challenge, I could have carried all of Brianna’s gear, water, etc. and provided her with support at any point. Brianna did not want this, however, and I did not give her any significant physical support while we were on the trails. With the exception of a few food items that we exchanged (in both directions), my support consisted of that which is allowed under the “pacer” rules that are typical in ultra marathons. Essentially, I provided emotional support and some assistance with navigation. I carried a SPOT satellite tracker and the notebook with which we recorded our progress. The data from the SPOT device was available via the link on my previous post for only 7 days. I have uploaded the data to Google Maps, and it is now available here. Unfortunately, the SPOT failed to provide an accurate record of our hike. For example, it provided no evidence that we climbed North Twin, and it logged only one waypoint on Tecumseh. Most annoyingly, it failed to send the update when we reached the finish at 7:15 a.m. on September 13th, and it incorrectly reported our start time on the Unknown Pond Trail as 11:54 a.m. on September 8th. Our actual start time was 11:35 a.m. In the end, the SPOT was good for providing general updates on our progress, but it was not reliable or accurate enough to show that we reached all of the summits and trailheads, and the times when we reached them. In spite of this, the SPOT did provide substantial evidence that we did what we said we did. For example, even though it did not record our finish time, the last waypoint it recorded shows us 1.1 miles from the finish at 7:04 a.m. on September 13th. In addition to using the SPOT, we recorded our times at summits and trailheads in an all-weather log book. The times were obtained using two Garmin GPS watches. The start time was checked with yet another, standard watch. This method provided a reliable record of our start and end times, but we did make a few mistakes recording our times at waypoints. Specifically, we forgot to record the time when we summited Flume, and the time when we reached I-93 after descending from Flume. In addition, I may have inverted the minutes when I recorded the time when we arrived back at the Unknown Pond Trailhead after summiting Cabot and recorded 14:42 instead of 14:24. The log book time for this waypoint was 14:42, and the SPOT time was 14:25. In this case, the SPOT time seems more reasonable because, as one gentlemen noted, it seems unlikely that we made the drive from the Unknown Pond Trailhead on Millbrook Road to the Starr King Trailhead in 25 minutes, even though I was driving as fast as I could in my Jeep (not the RV). The following table shows both the log book and SPOT times for each waypoint of the hike. Although neither the SPOT device nor our manual timing method provided an error free record by itself, together, the two methods provided an accurate record of when we reached the important milestones of the hike. * “Peak” or “Transition Area” message was not received. Time is from a “continuous track” message that was sent from, or near, the specified location. Many thanks go to my wife Melanie for single-handedly manning our support vehicle, a rented RV. She got it to where it needed to be every time, day and night, in spite of the many changes to our plan. She drove between trailheads as we regrouped and slept, picked up the mess we made at each transition, and made runs to stores and restaurants for special requests. Between all of this, she got about as little sleep as we did. Thanks also go to my son Michael for keeping family and friends (and Melanie) updated on our progress throughout the hike. He wrote a custom app that extrapolated our position from the data on the SPOT web site and generated an elevation profile of the hike (that includes driving legs). He was also instrumental in helping Melanie get to one of the transition areas on time.